Cholestetomatous chronic otitis media (CCOM) or cholesteatoma is a long-lasting infection of the middle ear defined as a keratinizing external auditory canal epithelium intruded to the middle ear causing erosion of surrounding structures. Two main pathological distinctiveness of cholesteatoma are destruction that causes life-threatening intracranial or extracranial complications (EC) and recidivism, which means capability to recidivate after surgical intervention. After suspicion and prompt diagnosis of cholesteatoma, a surgical method has to be chosen in order to obtain eradication of disease and prevention of complications, supported by medical antibiotic and other treatment. The goal of this study was to retrospectively review our 17-year experience in the diagnosis and treatment of complications of cholesteatoma and to compare with experiences of other centers. Ethical Committee of University Clinical Center of Kosovo approved this retrospective study. All patients that underwent surgical procedures signed consent after appropriate information about procedure and possible complications of surgery and anesthesia. In a tertiary clinical center, a retrospective chart review of all patients presented with CCOM for a period of 17 years was performed. First, all operation room protocols and charts of patients with COM are selected and then in a second selection the charts of patients with CCOM were selected. From this group, a group of 145 patients appearing with one or more complications was selected, all charts are carefully reviewed and statistical data are worked out. Symptoms and signs, ear, nose and throat (ENT) clinical examination, general examination, laboratory analyzes, imaging methods, medical and surgical treatment of each patients are reviewed and then tabulated. Patients with ear complications but without cholesteatoma were excluded from study. In a country with approximately 2 million inhabitants, University Clinical Center of Kosovo in Prishtina is the only medical center that cares about patients with cholesteatoma complications. During the period from January 1994 to December 2011, there were 2765 in-patients admitted to our clinic with COM (about 160/year). A total of 502 patients (or 30/year) had CCOM or cholesteatoma diagnosed. 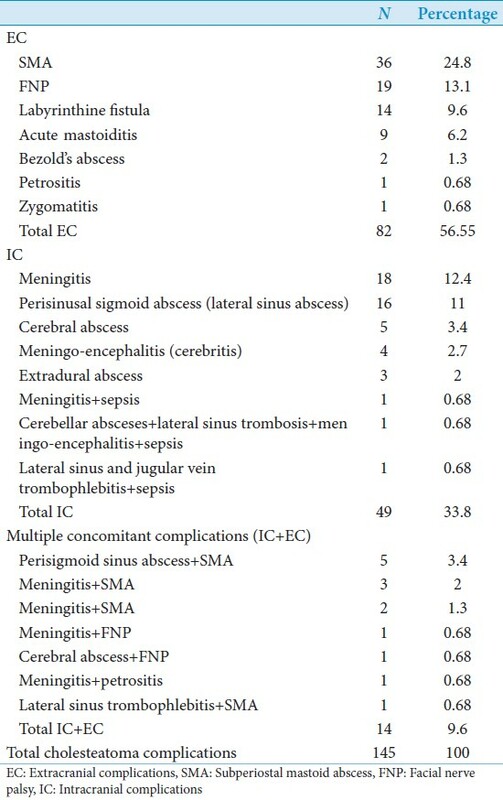 From this group, 145 patients experienced one are more complications and unfortunately 5 of them died because of ear cholesteatoma complications [Table 1]. From a total of 145 patients with cholesteatoma complications, 85 (58.6%) were female and 60 (41.4%) male. The mean age of this series were 30 years, ranking from 5 years to 70 years. We noted that about 30% of patients were aged 10-20 years. [Table 2] shows types of cholesteatoma complications in our patients. EC were presented in 56.55% of cases, 40% had IC and 9.65% had multiple concomitant IE/EC complications. Most often presented complication was subperiostal mastoid abscess (SMA) from EC, meningitis from IC and 5 patients had concomitant SMA and perisigmoid sinus abscess. Patients with multiple ICs (3 of them) are listed in the IC group. Diagnostic procedures applied for this series of patients was not standardized and divers from patient to patient. For some procedures, e.g., computed tomography (CT) scans, determinative was availability. For the period 1994-2003, CT was not available in our centre in all cases and is done only in 73% of cases. Laboratory analyzes, erythrocyte sedimentation rate, white blood count and in some cases C-reactive protein was taken in all cases and elevated values indicated developing complications. Pure tone audiometry was performed in all adult conscious patients. In 70% of patients, a mastoid tip X-ray procedure were performed, as only imaging method. CT scan was performed in 20% of cases, whereas magnetic resonance imaging (MRI) only in 8 cases with severe IC, due to limited availability [Table 3]. Treatment of these patients was combined surgical and medical (supportive). Types of surgical otological interventions are shown in [Table 4]. In all patients surgery is planned and performed according to the spread of cholesteatoma and type of complications. All cases with EC complications were treated in ENT clinic; cases with meningitis first were treated surgically in ENT clinic, then transferred to infectious disease clinic for further treatment, whereas intracranial abscesses are treated in cooperation with neurosurgeons. Finally, out of a total of 145 patients, 5 patients were died because of cholesteatoma complications, all with multiple IC. Rest of surviving patients healed without or with minor sequels. Long lasting stinking discharge from the ear, with polyps and conductive hearing loss are signs to suspect in CCOM and a diagnostic work-up have to be performed in order to establish a correct clinical diagnosis. This work-up must contain: An otoscopy and otomicroscopy with aspiration of discharge in order to differentiate between mucosal or squamous chronic middle ear infection; a microbiology swab of the discharging ear, laboratory analyzes, a pure tone audiometry, CT scan of temporal bon. In literature, all authors agree that gold standard in diagnosis of CCOM is CT scan and the early recognition of threatening complications is life-saving. , In our series, CT scan was not available in most of cases: Only 20% of patient performed CT scan that is far from the goal. As for MRI, in all cases when an intracranial cholesteatoma complication is suspect, a MRI scan is necessary, but in our series only in 5.5% of cases a MRI scan is performed. Treatment of complications of CCOM is surgical. Antibiotics are adjuvant supportive therapy given during the course of disease according to microbiology exam results or empirically. Other treatment is required according to type of complications. Surgery is keystone of treatment. The role of surgery in complication is to drain the suppurative content and to clean cholesteatoma entirely. Different approaches and types of surgery are in use, most of them canal wall-down techniques, combined with neurosurgery operations, in case of IC complications. Otogene meningitis is treated by mastoidectomy of affected ear and to follow treatment in infectious disease setting, than other IC cases have to be treated together by otosurgeon and neurosurgeon. Data from literature gives similar conclusions concerning to treatment of cholesteatoma complications. ,, Despite a various surgical techniques used for treatment of cholesteatoma complications and the fact that surgeon can change the type of intervention during operation, but one must be clear: Cholesteatoma surgery is not adventure, but a properly planned procedure with particular goal. 1. Long YT, Mahmud R, Sani A, Saim L. Complications of otitis media requiring surgical intervention. Asian J Surg 2002;25:170-4. 2. Mustafa A, Heta A, Kastrati B, Dreshaj Sh. Complications of chronic otitis media with cholesteatoma during a 10-year period in Kosovo. Eur Arch Otorhinolaryngol 2008;265:1477-82. 3. Kurien M, Job A, Mathew J, Chandy M. Otogenic intracranial abscess: Concurrent craniotomy and mastoidectomy - Changing trends in a developing country. Arch Otolaryngol Head Neck Surg 1998;124:1353-6. 4. Tos M. Incidence, etiology and pathogenesis of cholesteatoma in children. Adv Otorhinolaryngol 1988;40:110-7. 5. Olszewska E, Wagner M, Bernal-Sprekelsen M, Ebmeyer J, Dazert S, Hildmann H, et al. Etiopathogenesis of cholesteatoma. Eur Arch Otorhinolaryngol 2004;261:6-24. 6. Vazquez E, Castellote A, Piqueras J, Mauleon S, Creixell S, Pumarola F, et al. Imaging of complications of acute mastoiditis in children. Radiographics 2003;23:359-72. 7. Albers FW. Complications of otitis media: The importance of early recognition. Am J Otol 1999;20:9-12. 8. Keles E, Kaygusuz I, Karlidag T, Yalcin S. The complications of otitis media: Retrospective assesment of 51 cases. Turk Arch Otolaryngol 2004;42:215-9. 9. Osma U, Cureoglu S, Hosoglu S. The complications of chronic otitis media: Report of 93 cases. J Laryngol Otol 2000;114:97-100. 10. Kangsanarak J, Navacharoen N, Fooanant S, Ruckphaopunt K. Intracranial complications of suppurative otitis media: 13 years' experience. Am J Otol 1995;16:104-9.